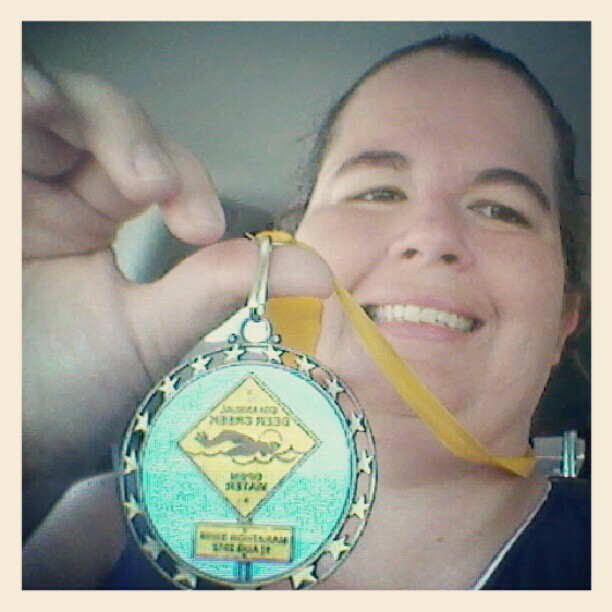 The big race has come and gone and I finished!!!!!!!!!!!!!!!!!!!! It was such an awesome journey. I still can’t believe that I actually did it. It was so exhilarating. The day started early in the morning. Having taken some serious sleeping meds I actually got a pretty good sleep. Then I ate my traditional pre-race breakfast bowl and headed to meet Michele. 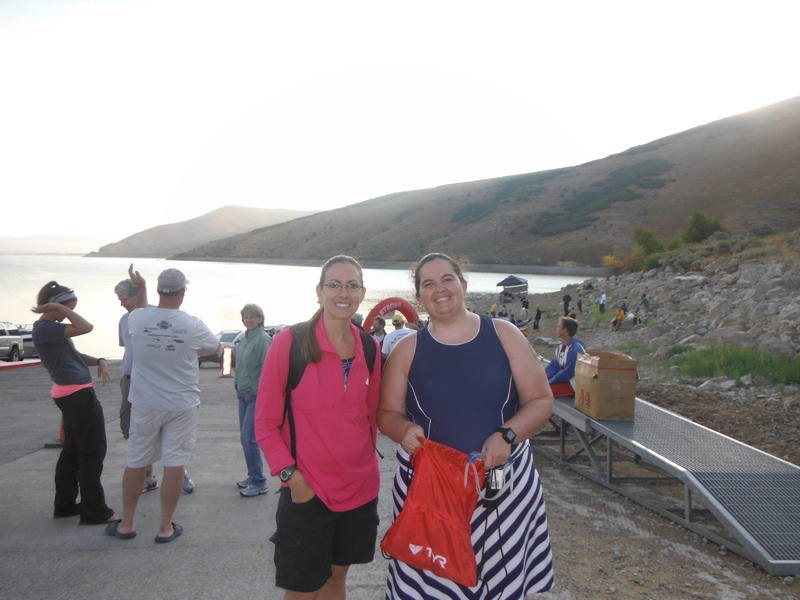 Michele is my trainer and kindly agreed to kayak for me at the race. For having only kayaked a couple of times she did great and was very encouraging. 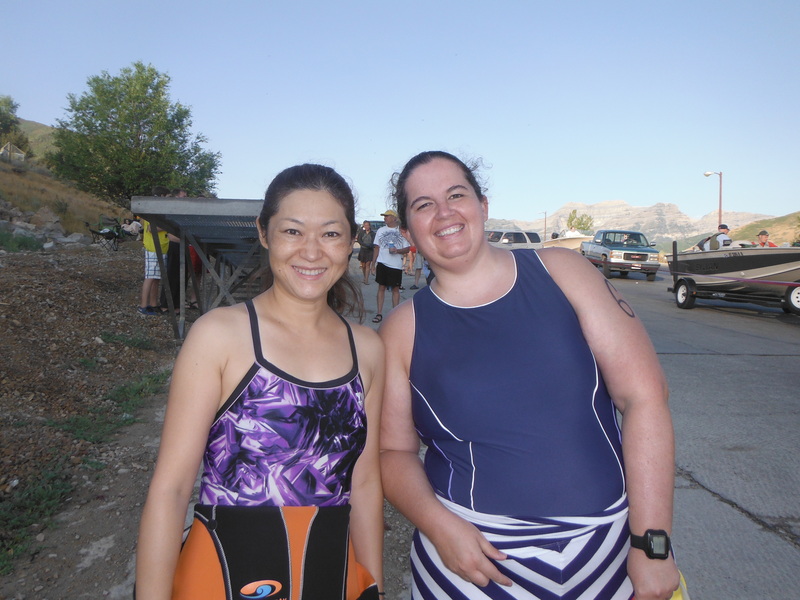 We drove down to Deer Creek Reservoir and met up with my swim family. 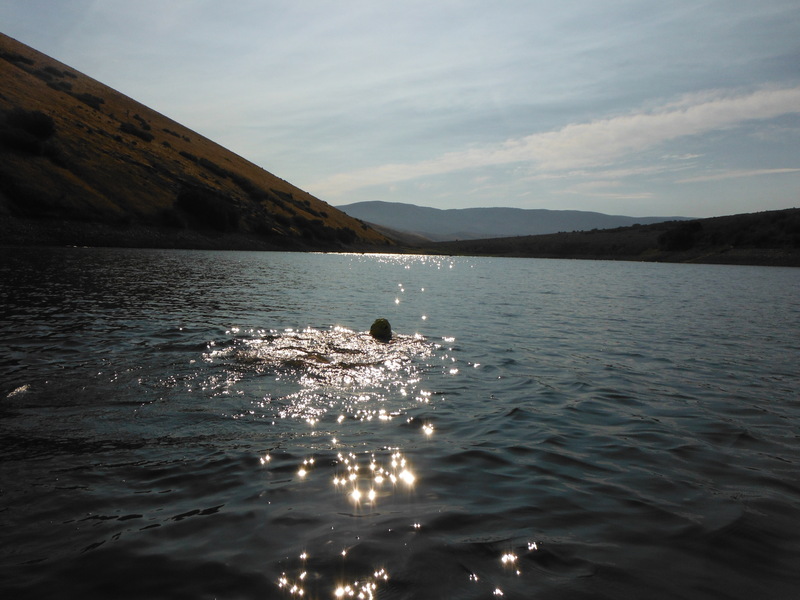 Some of them couldn’t make the race because of other commitments and some were overseas helping Gordon Gridley swim the English Channel (great job Gordon!) . But a lot of my friends were there and I really can’t say enough about the bond I feel with so many of the other swimmers. 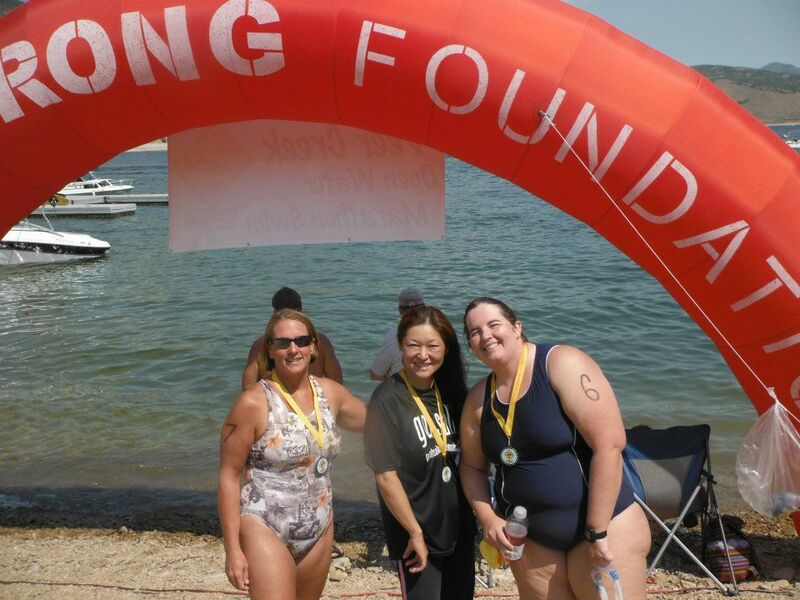 They are just the best, cheering me on, waving in the water, hugging me when I finish. It is so wonderful to be a part of. Charlie’s Angels eat your heart out! 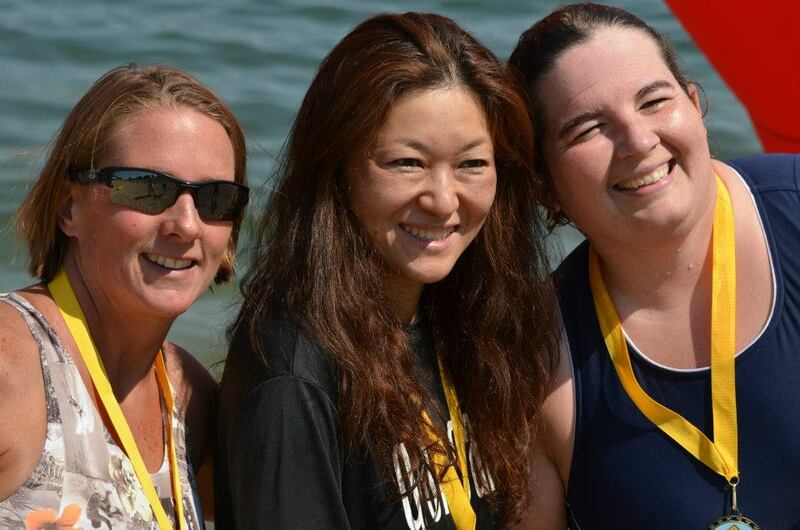 Sue, Etsuko and me medals in hand. 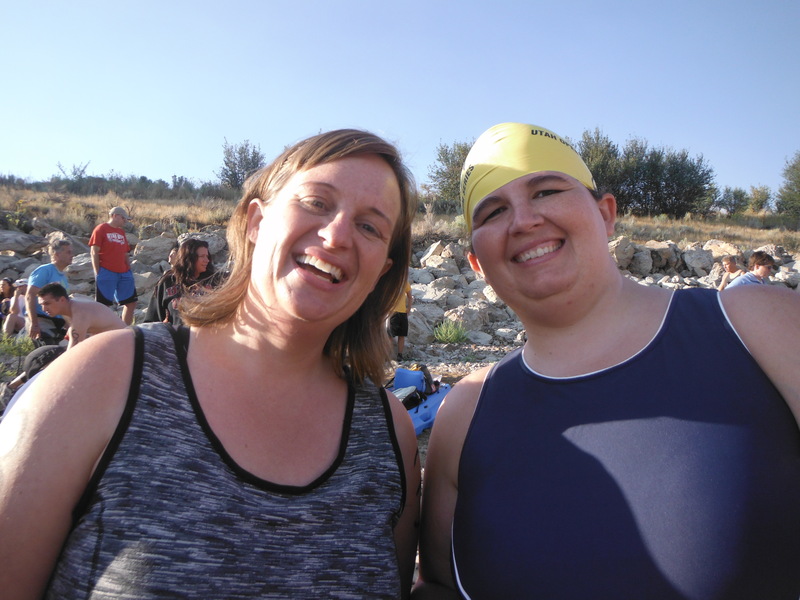 It took a while to get everything started but at about 8:40 we were in the water and on our way. I did better keeping with the main group than I’ve ever done before (and I didn’t finish last! 🙂 ). The water was like glass, beautiful and it is a gorgeous lake. The only challenge was it was hard to find things to sight to because the buoys were small and not a lot of large trees or formations to look at. Isn’t that beautiful. I honestly don’t understand how anyone couldn’t love open water! It’s so amazing to be swimming in such gorgeous settings. So much better than a pool! I made it to the 1/2 mile length fast and was surprised at how I clipped along the first half. I’m not sure what my time at a mile was but I’m sure its the best I’ve ever done. There was a bit of confusion for me at the 5k turn around but Michele touched me with the paddle and let me know I was going the wrong way! At about that point I got cramps in both my legs. My legs felt tight the whole morning and I was honestly waiting for the cramp to come. I could feel it dying to come out. I was scared when both legs started cramping but I was able to wiggle the cramps out and keep on going. Honestly swimming was the best thing for the cramps. It was only when I stopped that their mischief started. I did 2 feedings during the 5k eating gel packs. They are so gag inducing but do help with the cramps. I also had a vitamin water this time and I love that! It was sweet enough to give me energy without spiking my blood sugar more than it already was from so much exercise. It also has electrolytes and other vitamins to help with the race. It definitely helped me finish. At about the 2:15 mark I made it back to the 1/2 mile buoy and as crazy as it sounds that last 1/2 mile was definitely the hardest. There started to be more boat traffic and the big lumbering waves boats make are tough (tough both for me and Michele!). I felt like the finish line was never going to come. Then I saw it and I pushed and pushed, practically sprinting the last 50 yards. To finish you had to smack the finishing buoy which I did in enthusiastic fashion. Done! I had done it. Me the overweight girl from Draper had just swam most of a lake. 5k! I still can’t believe it! It honestly was one of the best days of my life. 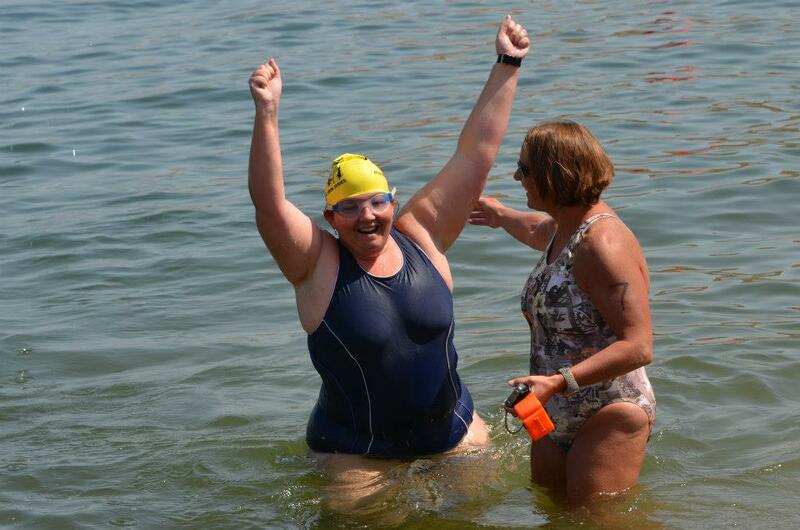 Every swim I do is one of the best days of my life. I’m so grateful to have such an awesome sport in my life and to be considered an athlete. Who would have thought? Thanks to everyone for your love and support. It may not be gold but I guarantee you no Olympian has worn a medal with more glee than I wore my finishing medal today. Hurray! Finished, done, another one in the history books! Hurray! I knew you would finish with ease. I didn’t have a doubt in my mind. You trained hard and “made tons of deposits” for your big “withdrawal.” Keep up the good work hoss. Maybe, if shoulders hold up, I’ll see you at Slam the Dam, although the most I’d be doing is the 1.2-miler. Thanks. 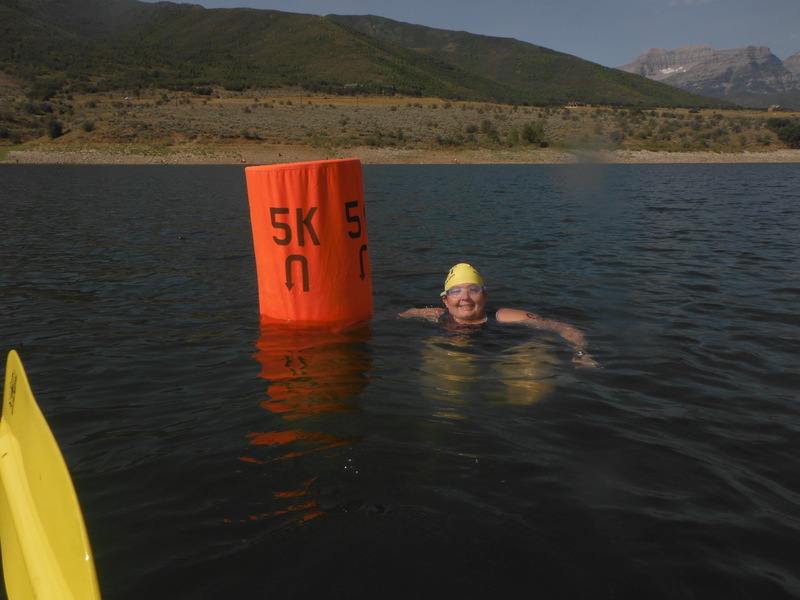 I couldn’t do it without all the support from my Utah Open Water family. I hope your shoulder doesn’t put a damper on your goals. I live in constant fear of that. I’m signed up for the 1.2 at Slam the Dam because I want to have enough energy to have a little fun while I’m in Vegas. I haven’t vacationed at all this year and its one of my only chance. I thought it might be fun to go see O by Cirque de Solei because its all set in water. We will see. Last year I could hardly move but hopefully I’ll do better this year!